National Employee Freedom week began as an ambitious, yet local, effort to let teachers in Las Vegas, Nevada, know that they didn’t have to belong to their local union if they didn’t want to. It was a simple campaign to let teachers know that union membership is, in fact, a choice—not a requirement—for pursuing a career in educating Nevada’s next generation. And the response to this simple campaign was overwhelming. Thanks to these opt-out campaigns over the years, Nevada's largest school district, Clark County, has seen almost half of its teachers exercise their right to leave a union they feel is inadequately representing their interests. It was quite obvious that such a campaign shouldn’t be confined merely to one county in one state! Along with a small group of organizations from around the country, Nevada Policy Research Institute partnered with the Association of American Educators to spearhead National Employee Freedom Week — a week dedicated to the idea that no-one should ever be forced, coerced or pressured into joining a union if they don’t want to. By 2017, over 100 national and state-level groups joined the coordinated effort to raise awareness of pro-worker freedom reforms such as “Worker’s Choice” — a policy with which nearly 80 percent of union members agreed. 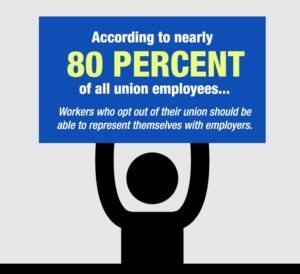 In the end, Employee Freedom Week and its coalition partners are about one thing: making sure every worker has the right to decide for themselves whether or not union membership is the right decision.